Hello, gardeners and friends of gardeners! 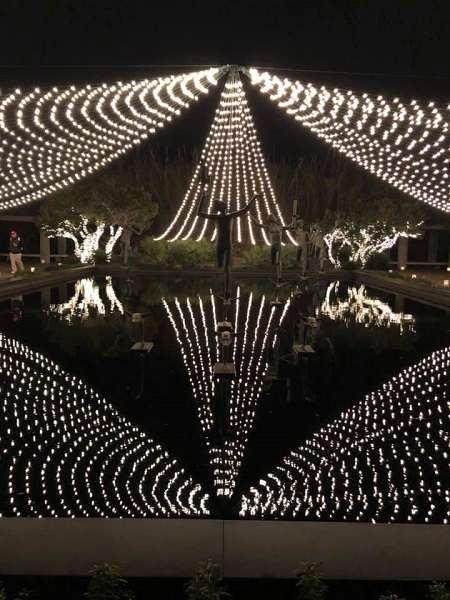 Are your yard and garden ready for Christmas? 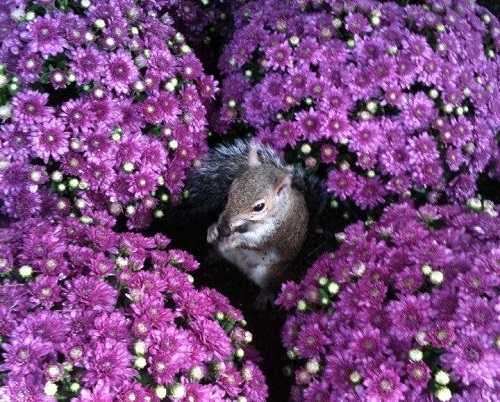 The squirrel above, busy getting ready for winter, was photographed by one of my Swiss friends in a park in the USA. Not sure where. He wasn't writing in English. If only those little critters were not so destructive. Hurricane season is over in South Carolina. Thank goodness. 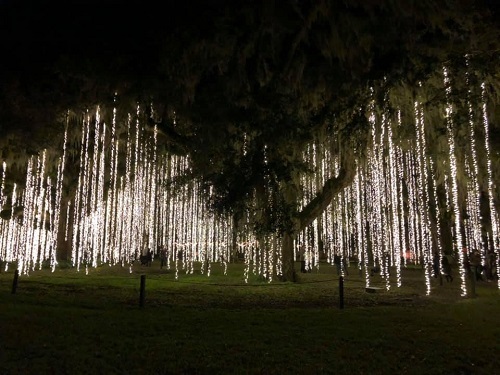 My niece and her husband returned to Brookgreen for their Nights of a Thousand Candles. 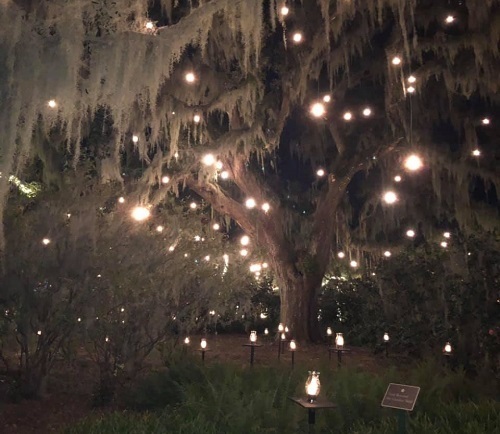 See Brookgreen Gardens come to life amid the soft glow of more than 4,500 hand-lit candles and countless sparkling lights. 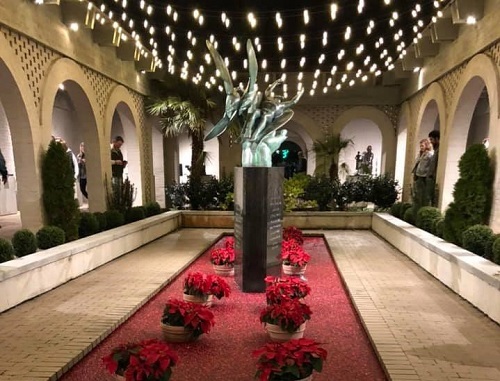 From 3 - 10 pm walk the paths with a warm cup of cider, hear the sounds of holiday music, carolers singing, and celebrate the season with family and friends! 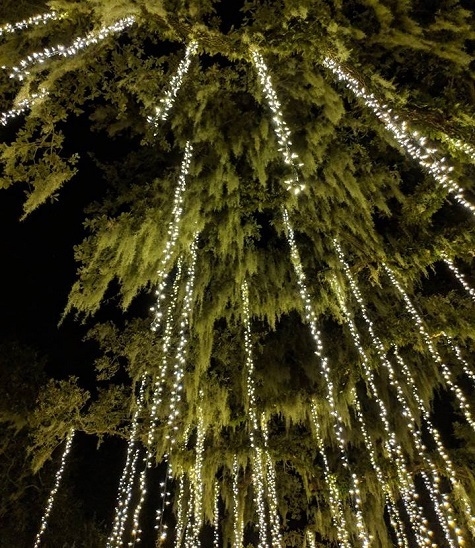 Some trees really are adorned by a lot of lights. Can't tell if there is a little elf or something near the base of the trunk. 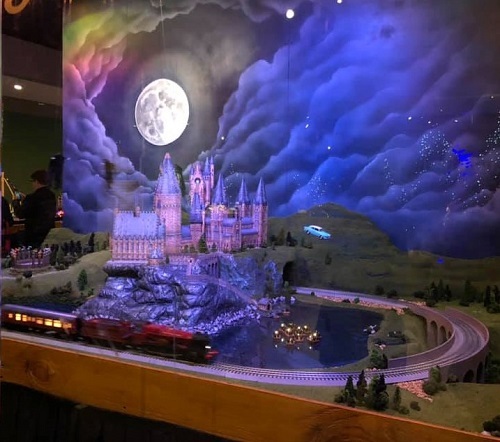 You can go indoors for some exhibits, including a Harry Potter-themed miniature train set-up with a flying car on one side and dementors flying above on the other. 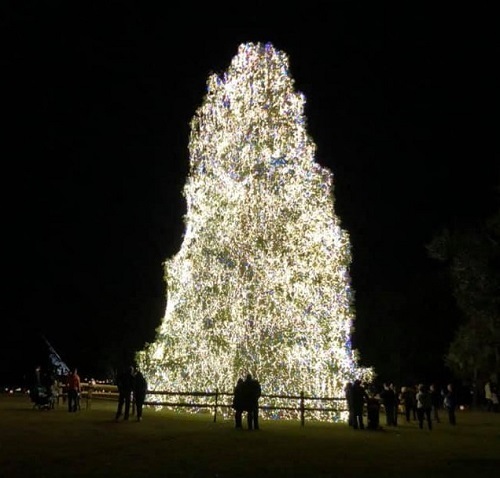 And here's a community Christmas tree. Do you have one in your town? 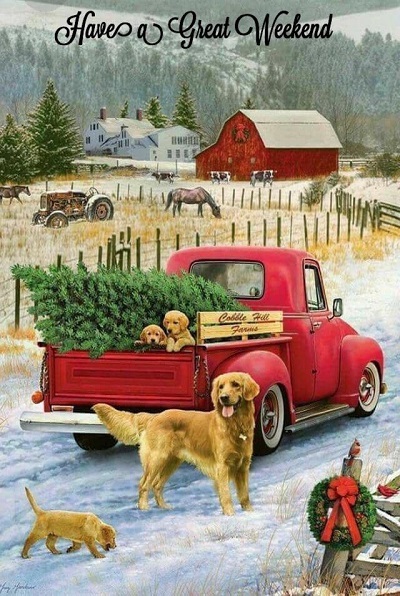 Many people are practiced at picking the perfect tree. They'll judge on things like color, size, shape, needle quality, and bushiness. But behind the annual selection of a coniferous house guest--some 30 million of them a year, in the US--is a ton of science. 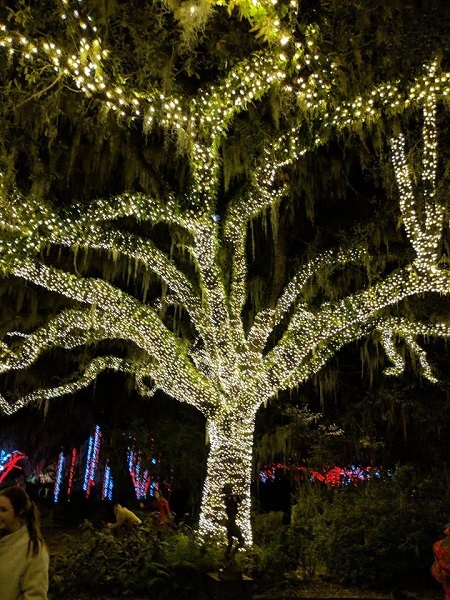 To Bert Cregg, identifying exactly what makes a tree perfect is more than a holiday tradition, it's a major part of his job. 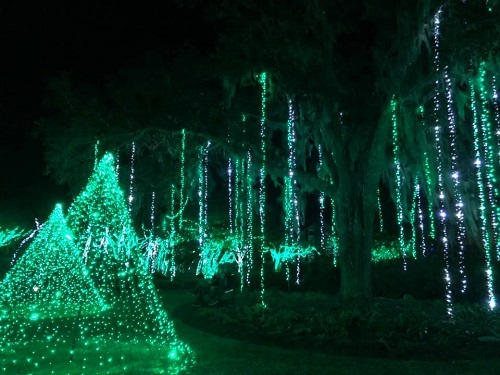 He's a forest researcher at Michigan State University and a renowned expert on Christmas tree production. His work covers two main areas: genetics and culture techniques. 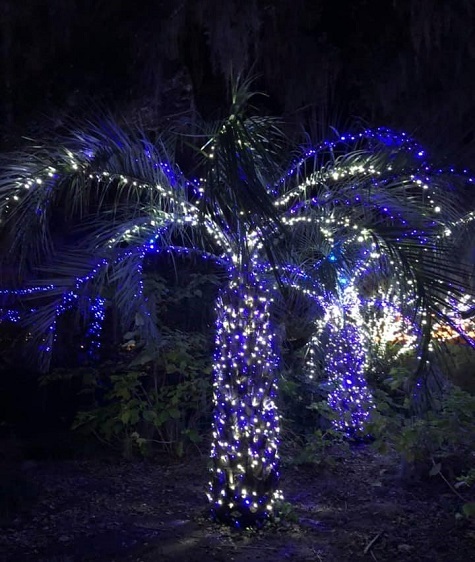 "Basically, how can we identify species and seed sources that are going to lead to better Christmas trees, and how can growers manage their farms to produce better trees," he says. Thirty million. Ever thought about growing your own? Ever grown your own? How did it turn out? Here's something a little different. 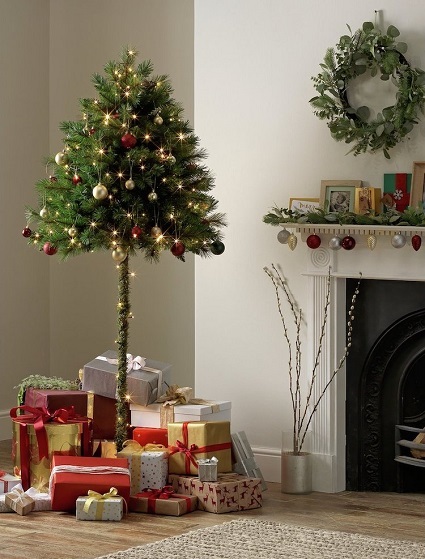 Think this tree is cat-proof? I wouldn't count on it, personally. Maybe there's something I don't know about it. Not much to eat in most gardens this time of year, but the oranges are on here. And here's a banana from somewhere in Central California. Perhaps near the coast. They would fit in most Christmas stockings. Heh. I have been getting email notifications and gift certificate offers from various seed catalogs. I kind of like the one from Nichols, a smallish nursery in the Northwest. You can order a mail gift certificate or get a PDF certificate until the weekend before Christmas. If you want to place a veggie seed order (0or herbs, spices or teas), use the promo code CHILLY for 20% off on the "view cart" page. There's a recipe for Triple Ginger Cookies on their Gardener's Pantry Blog. Ever grown Mache? 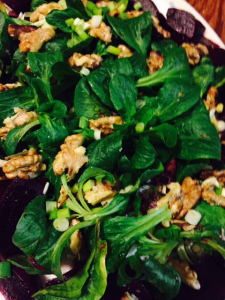 Here's a winter salad with beets and walnuts. They also carry beer and winemaking supplies and some other stuff. Get some Variegated Barley Cat Grass for your pets. Just a dollar. I am ordering seeds for a friend from Pinetree. Just love these succulents. 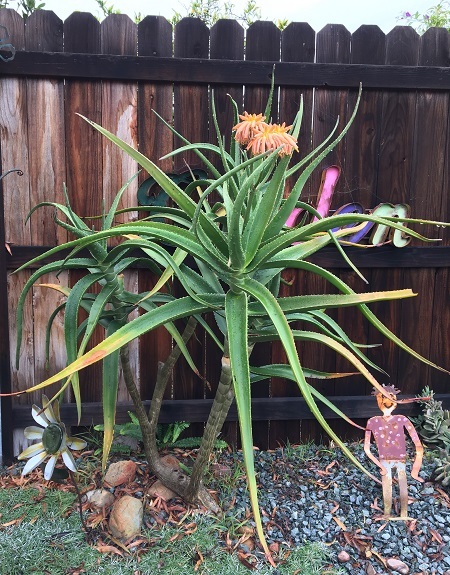 Here is one of my Aloe bainesii in bloom. Got lucky, great nursery in the area had some agaves on sale and a Charley Brown aloe. (He looks like he fell over and many of his arms are mangled. But he was 1/2 price and he will weather the incident). Think I need to go back and buy three more. I'm addicted, what can I say? AOS and your garden thread really make my day. I like the color of the flowers. And they look kind of whimsical to me. Aloe bainesii is also called Tree Aloe. It grows to 15 meters in its native habitat and up to 30 feet in favored locations in the USA. It gets pretty wide, too. Its current scientic name is Aloe barberae, but it will probably still go by its older scientific name in nurseries for a while. The plant above will likely be even more impressive in the future. Include your nic unless you just want to be a lurker.